★★★★★ Thank you so much. I love the New Women's Speed Vest, the fit is wonderful. It's perfect! The Women’s Speed Vest™ is IRONWEAR®’s latest design for female athletes of all ages. It is designed especially for increasing muscle strength and bone density to help combat osteoporosis without the use of drugs. 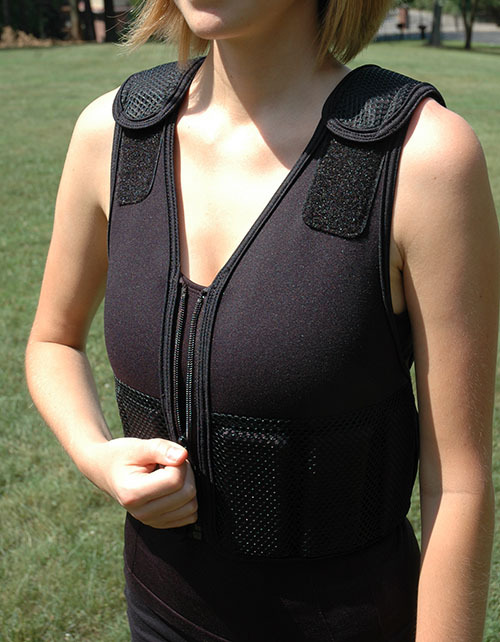 The vest was designed to make wearing a weighted vest safer, simpler, and more comfortable. 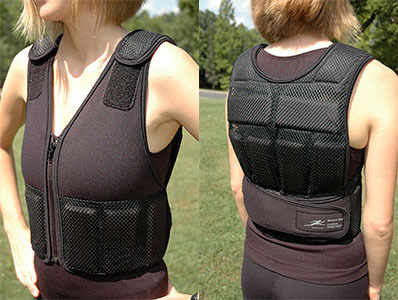 The Women’s Speed Vest™ is the safest weight vest available. The unique design has a heavy duty front zipper which makes it easy to put on and take off the vest. Most weighed vests require lifting the vest above the head to put it on, which is often difficult. 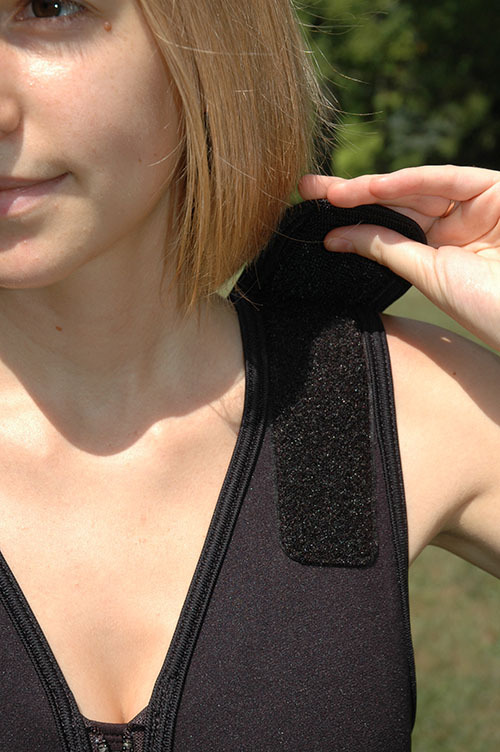 Every aspect of the vest is soft and flexible, from the soft bound edges to the soft weights. 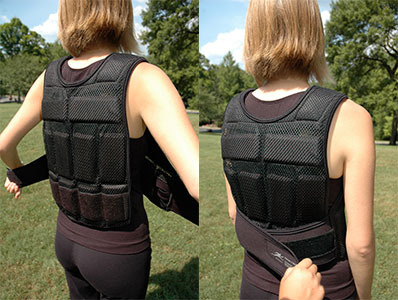 The Women’s Speed Vest™ is the simplest weight vest available. The creative design fits a wide variety of cup sizes and waist measurements from 24 inches to 42 inches. The adjustable belts are in the back and can easily be set up the first time the vest is used. We recommend that you have assistance to adjust the straps for the initial use, after which no adjustments are normally necessary. Just put it on and take it off like a jacket. 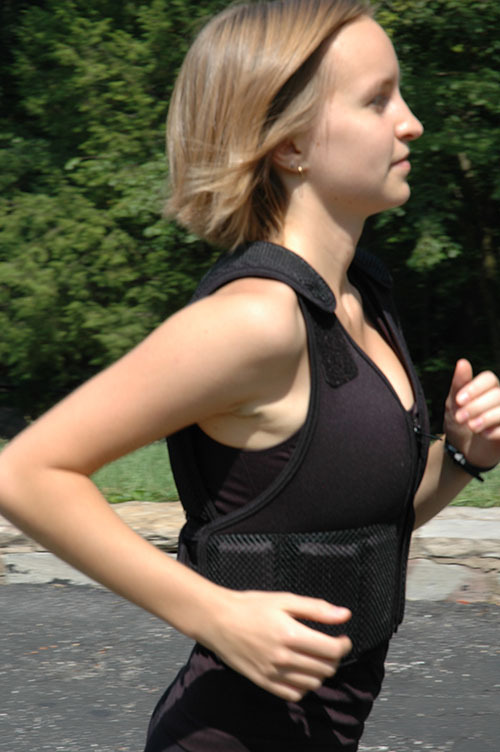 The Women’s Speed Vest™ is the most comfortable weighted vest. The vest contours to the curves of the body and leaves the breast area unencumbered for optimum comfort without downward pressure or constriction on the chest. The shoulder straps are adjustable to properly fit any chest size and the padded belting system acts as back support to help strengthen abdominal and back muscles to improve posture. 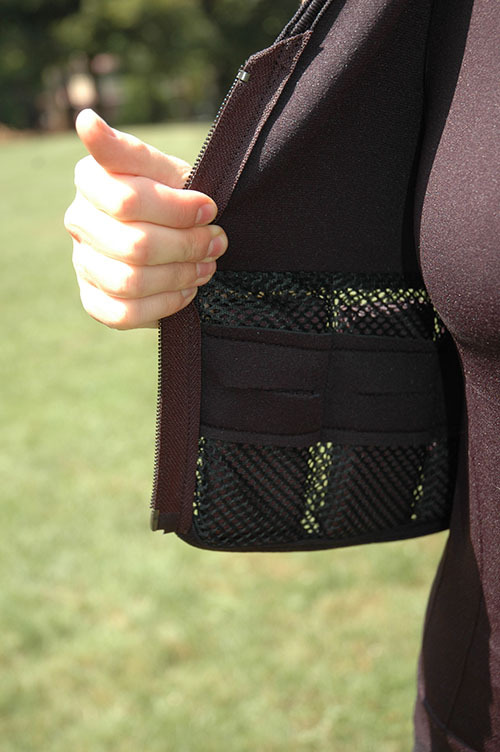 Every aspect of the Women’s Speed Vest™ bends with you as you move. The two overlapping belts attach in the back and snuggly hold the front weights against the abdominal muscles and expand to allow you to breathe easily. The Women’s Speed Vest™ utilizes the Double-lock™ belting system to ensure that the vest stays in place during any level of activity. Both the ends of the belts and the vest edges are locked into place. When properly adjusted, the abdominal weights sit on the stomach just below the breasts. The Women’s Speed Vest™ can be weighted with more weight in the back than in the front, which helps to pull back the shoulders and lift the chest. The Women’s Speed Vest™ uses IRONWEAR®’s patented Flex-metal® weights. Unlike other solid weights that will bruise the skin, these weights are safe and can even act as padding if you fall. 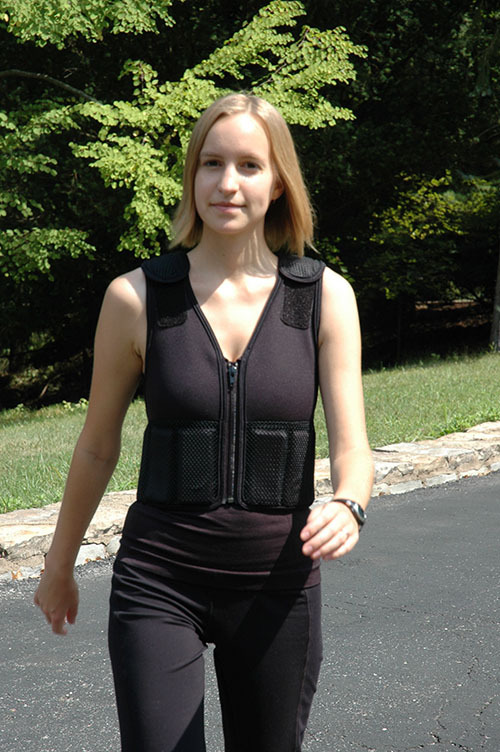 The thin mesh construction and V-neck design allows the vest to breathe and does not hinder your movements and makes it easy to use the vest during all kinds of activities including walking, cleaning, running and playing sports. It is great for training at home, outside, or in the gym. The Women's Speed Vest™ is simple to use and clean. The vest can be hand or machine washed in cold water with the weights removed. It should be hung dry. The outside consists of thin nylon mesh and the chest area is made of a soft knitted nylon and neoprene laminate less than 1/2 mm thick. 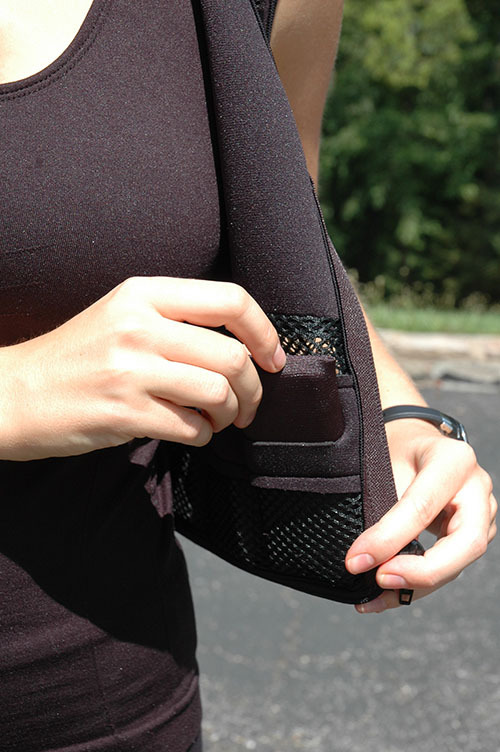 The interior mesh weight pockets are designed to accept 1 or 2 1/2 lb Flex-metal® weight inserts. The vest has 16 weight pockets and the vest shell alone weighs 1/2 lb. The Women's Speed Vest™ offers safety, simplicity, and comfort unmatched by any other weighted vest and is a great muscle and bone strengthening tool. Model is 5'1", weighs 96 pounds, and wears bra size 34DD.